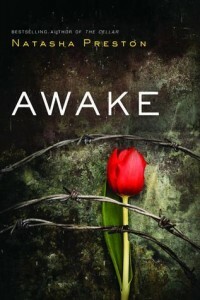 Awake is an odd book at first. You know that the new boy, Noah, who is interested in our girl Scarlett is a bit off. He’s a little too attentive, a little too perfect. My internal “stalker!” sensors were going off, until it’s revealed that Noah has actually been sent by someone to make Scarlett fall in love with him. At that point, the book runs away with you. The Eternal Light Commune – read: cult of the creepiest variety – is currently located in the west of Ireland. They live entirely off the land, work together, practice kindness and encourage simplicity. They also believe in human sacrifice, so that puts a bit of a damper on things. Noah is a member of that cult, sent by its leader, Donald, to bring Scarlett back to Ireland as she is to be that sacrifice. You can imagine that she is not quite, you know, keen to that. There’s also this complication that Scarlett has always had no memories of her life from before age four – until she meets Noah and starts getting flashes of memory. There’s a lot in this book to grab readers – the blossoming relationship between Noah and Scarlett, the tension between Scarlett and her parents over the lost memories, the mysterious phone calls Noah places to Donald. It’s a YA book for sure – I’d target this firmly at high school/secondary school age. The slow start makes it a bit challenging to get into, but I think once readers do, they’ll enjoy it. Noah makes a lot of comments about the chemicals that people put in their bodies – from modern medicine to processed food to caffeine. While I agree we who live in Western society should probably take more care with what we ingest, chemicals are also yummy. Let’s be honest here. So the drink is a bit of rebellion to Eternal Light – get yourself some mass produced soda – a Diet Coke or Diet Dr Pepper would be my choice. Escape from a Quiverfull Cult: This story on XO Jane is about a woman who took herself out of a cult in the United States. Some of her emotional processes parallel Noah’s as he wrestles with the truths and lies of his life. Elizabeth Esther: Elizabeth grew up in a fundamentalist cult run by her grandfather and has written extensively about how she left and what her life is like since. Her book Girl at the End of the World is a must-read for anyone interested in this type of thing. Goodreads on Cults: This is Goodreads’s list of most popular books on cults. If you want to fall down a literary rabbit hole, then this is the place to start. Sociology on Cults: There is an absolutely dearth of scholarly articles on cults written by sociologists of religion. However, because academia is often annoying, most of them are behind paywalls. This site – which is written for high school students – offers a clear and concise explanation of how the discipline views this phenomena.